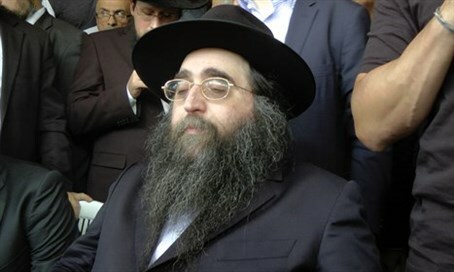 Shuvu Yisrael sect head, who twice collapsed on way to corruption trial, to get constant medical supervision. Jails prep for him and Olmert. It was decided on Sunday that Pinto requires ongoing medical supervision, and therefore he will be imprisoned at the IPS medical center, located in the Ramle Prison compound, reports Channel 2. Pinto's case has long been delayed on medical grounds. Last October he collapsed at the entrance to a plane set to take him back to Israel from New York to stand trial in his corruption case. It was in fact the second time he collapsed on his way to trial. Last April he flew from New York to Israel to stand trial, but apparently suffered a heart attack on the plane and was brought directly to the hospital before returning to New York for medical treatment. Pinto's followers said last October that he suffers from cancer, that he underwent several surgeries causing him to lose 30 kilograms (66 pounds), and that he has been greatly weakened as a result. Aside from Pinto, former Prime Minister Ehud Olmert is to begin his jail sentence on Monday, serving 19-months for bribery and obstruction of justice. Olmert is to enjoy deluxe prison conditions. IPS commissioner Lt. Gen. Ofra Klinger on Sunday morning addressed the high-profile incoming prisoners, issuing a letter to all ISA prisons. "We work without discriminating based on religion, gender, ethnicity or public standing," wrote Klinger. "In the coming days we will take in to jail facilities senior Israeli public figures. We will not deal with their acts, the legal system has already dealt with that and sentenced them. We will deal with our mission - to do our duty with skill, professionalism and discretion."